Sometimes it's tough to know where to turn when your dog, cat, iguana, or other friend--feathered or furry--isn't feeling well. 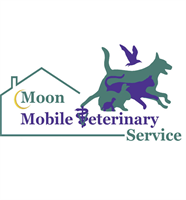 Here at Moon Mobile Veterinary Service, we want to make your pet's vet visit as stress free as we can. That's why we come to you. We provide a list of in home services that includes: Physical exams, Blood Work, Vaccines, Health Certificates, Acupuncture, and in home Euthanasia. We feel that when your pet is sick the last thing he or she needs is to be stressed, especially if it can be prevented. So, when you look for your pet's next Veterinarian, I hope you will consider us for you needs.